A UK woman's home was infested with thousands of wasps, unbeknownst to her. The nest had grown so large because the family rarely uses the room on the second floor of their five-bedroom home, he said. 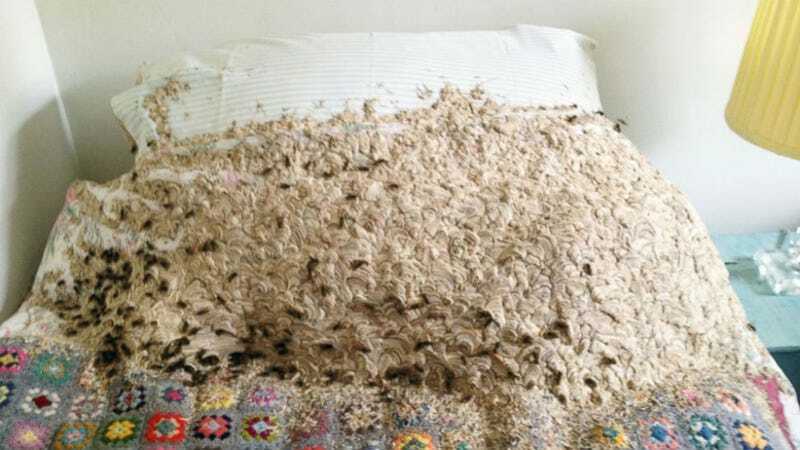 The wasps snuck in through an open window and used the bed as their home for nearly three months, chewing through eight inches of the mattress and two pillows, according to Birkett. The family most likely didn't hear the wasps accumulating because they are silent while nesting, he said. The only logical response to this is, of course, AHHHHHHHHHHHHHHHHHH. Do you know those stories about people who burn their house down while trying to kill a spider with fire? If that had happened here, it would have been a rational and completely justifiable thing to do. "I got dressed up looking like 'Batman and Robin' and went into the little tiny bedroom. I was spraying them left right and center," Birkett said of his wasp-fighting duties. I would not go into that room with the freaking Hulk covering my six. Nope. There's some really good news to come out of this story—after two hours of work, the wasps are not only gone from the home, but Birkett was able to save the blanket. Let's all stand up and give this man a giant round of applause.